Dr. Bagchi has industrial experience in both Civil Engineering and Information Technology. He has received a number of prestigious awards including the NSERC Postdoctoral Fellowship. 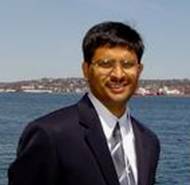 He is a licensed Professional Engineer in Ontario and affiliated to CSCE, ASCE, CAEE, and ISHMII. He has authored/coauthored more than fifty articles in technical journals and conferences, two patent applications, and a number of technical reports for academia and industry.